The Oaks at Flemington is one of the hottest dates on the Melbourne racing calendar. 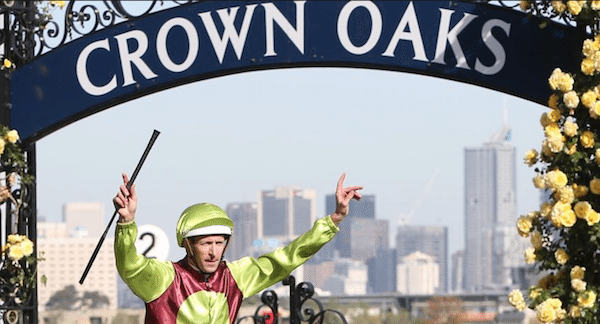 Find out all you need to know about this prestigious Group 1 event, including which online bookmakers have the best odds and the biggest promotions for Oaks Day. The Victorian Racing Club Oaks is a Group 1 race held for three-year-old fillies on the third day of the Melbourne Cup Carnival and is the feature race on what is widely referred to as Ladies Day. The Oaks is one of the oldest and most prestigious races in Melbourne and has existed on the racing calendar for over 150 years. The race is always on exactly two days after the running of the Melbourne Cup. The race is restricted to three-year-old staying fillies over 2,500 metres at Flemington and is at set weights (55 1/2kg) and is considered the premier fillies-only race that is held in Melbourne’s spring. The total prize pool for the Crown Oaks is $1 million dollars. Jameka, Mosheen, Magical Miss, Special Harmony and Miss Finland have all greeted the judge at the famous Flemington racecourse in first position in the Oaks. The race day is one of the most popular events throughout the Spring Racing Carnival. Oaks Day routinely draws crowds of 70,000 punters to the famous Flemington racecourse; the event peaked at 110,677 to be the sixth highest attendance of all-time at the venue. 2015: There had been a lot of hype around Jameka prior to the race, but punters would have been nervous when a brave Damien Oliver let her have her head at the turn at the top of the Flemington straight. The move proved to be a shrewd one however, as the bay filly tore away to hand trainer back-to-back wins after winning the year before with Set Square. 2008: Sydney-sider Samantha Miss held the majority of the market money, but after a good jump the bay mare out of Redoute’s Choice was shuffled back in the running and needing a bit of luck to be amongst the placings. A peach of a ride from Hugh Bowman ensured Samantha Miss’s run was time to perfection, handing the jockey his first group 1 victory in Victoria. 2004: The $2.20 Hollow Bullet favourite refused to settle for half of the running and the other half she was pocketed with nowhere to go. There was less than 400 to go in the feature and the favourite was still in traffic, prompting David Taggart to pull her to the outside in a desperate move to find clear racing room. The move proved to be a masterstroke as Hollow Bullet made up five lengths in less than 300 metres to record one of the greatest Oaks victories of all-time. There are plenty of online bookmakers that claim the be the best of the best in Australia, but who has the time to actually check which sites can live up to their lofty claims? Luckily the team at BettingSite.com.au has gone through all the bookies in Australia and highlighted the go-to sites for those looking to invest their money on the VRC Oaks.